How to rent a sailboat in San Diego, CA? Ask no more! The Mission Bay Aquatic Center, is a great place to rent outdoor water equipment (like Hobie’s, Keelboats, etc. ) at a competitive daily rate. 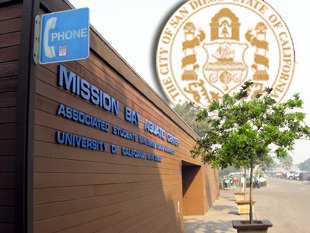 Growing up in San Diego I spent my summers sailing on Mission Bay and that’s where I discovered the Mission Bay Aquatic Center. It was built to supply students from UCSD discounted rates on renting outdoor water equipment. It is also the world’s largest instructional waterfront facility. Last year over 15,000 particpants took part in classes in everything from wakeboarding to sailing. Of Course Rentals on all this equipment is provided here too. Here is a link to their website and rentals page. Watch our short 1 min video about our visit to the Mission Bay Aquatic Center. Send us some feedback, with questions or comments about your experience at the Aquatic Center. Yay San Diego! I’ve lived around there my whole life and hadn’t heard of this place. But I do love mission bay and I’m def going to check that out next time I road trip down there! Hey Paul- thanks for the comment. We love San Diego too (it’s kind of hard not to). The Aquatic center is a great place to check out if you’re just looking to rent for a few hours or a day sail to test out a new boat.